Crusader Monk will be closing the doors indefinitely as of today. In short, I was offered a full-time job with the U.S. Army as a civilian instructor. While the job is not terribly far away - the additional changes of going through a separation and relocating my residence won't allow me to take further commissions. Crusader Monk will eventually return, of that I have no doubt. However, once again, I want to extend my genuine thanks and appreciate to those who have supported the shoppe over the last few years. As part of my shutting down, I will be offering a deep discount on the last two pieces I have in the shoppe. I am just looking to move these, I'll be taking a substantial loss on them - but my loss is your gain. This sword is brand new. All edges and peen have been smoothed for a more pleasing aesthetic. Celtic cross conchos have been added to the pommel insets to make her look unique. 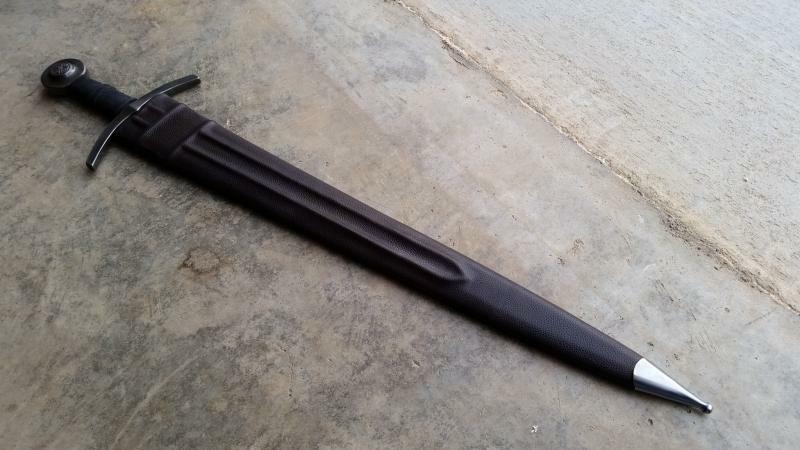 The hilt components have been given a medium dark patina to contrast with the appearance of the blade. The grip is a rougher texture pigskin for positive grip in the hand. I am including TWO scabbards with this sword. The oxblood one bears a triple riser with an x-strap detail with a mild steel chape. The chocolate brown one had standard risers with a mild steel chape. Normally, one of these scabbards would cost $250 from the shoppe. 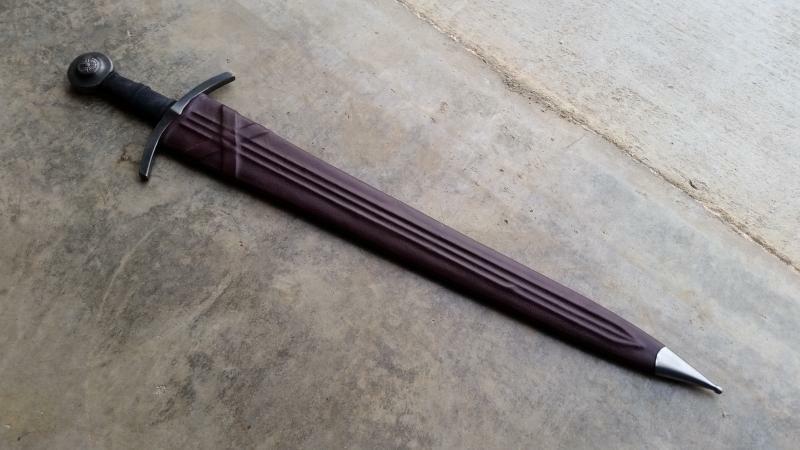 I am selling the sword and both scabbards for only $333. This means you are only paying $111 a pop for the sword and each scabbard. The items in this package would be over $800 if commissioned new. Shipping is $17 anywhere CONUS. This sword is brand new. 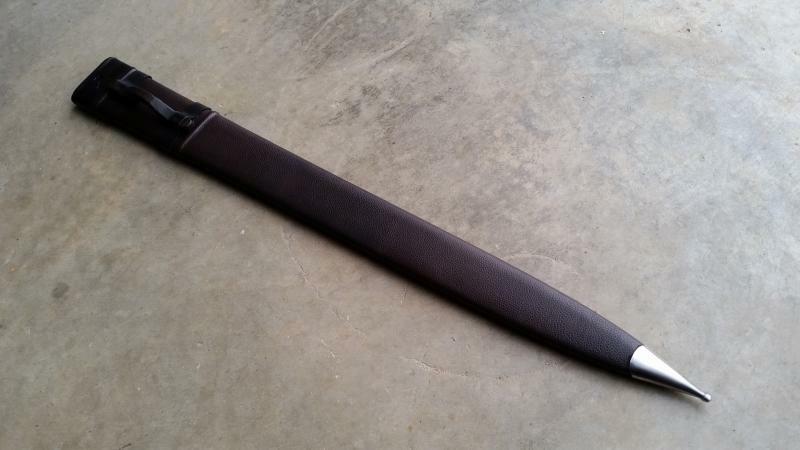 The hilt components were given a nice satin finish overall to make her more appealing. The grip has been given a rougher texture pigskin wrap for a positive grip in the end. I am including TWO scabbards with this sword. The oxblood one has a mild steel chape and a hand carved antique oak strap bridge. The dark chocolate one is the exact same. Both have a black leather locket embossed ith Thors hammer. These scabbards with also fit the H/T Norman sword! 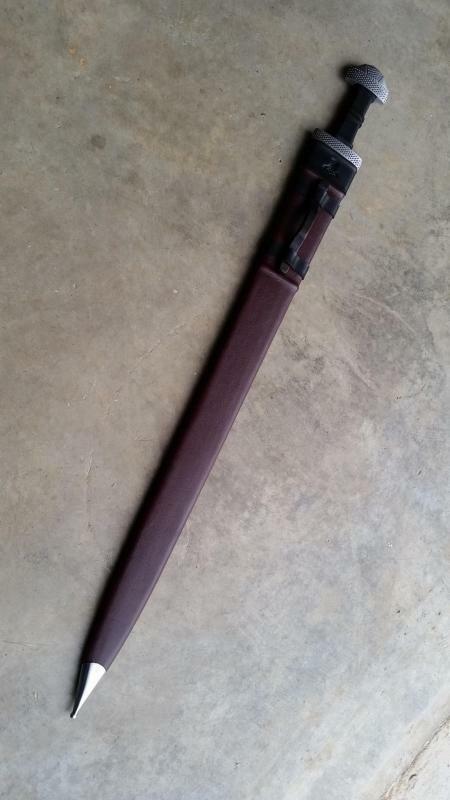 I am selling the sword and both scabbards for only $333. This means you are only paying $111 a pop for the sword and each scabbard. The items in this package would also be over $800 if commissioned new. Shipping is $17 anywhere CONUS. Selling out and getting on the road; lock, stock, and barrel - so needing to get these last few items gone fast. PM me if you are interested. Thanks for looking and please have a very happy Holiday season! Going out with a BANG, I see. Damn, if only I hadn't already wasted all my disposable money on gifts and such frivolous Christmas stuff! That Windlass XIV would exactly fill a hole in my collection, and would doubtless be a better long term investment than the happiness and good will of friends and family. Alas! All items have been sold. Thank you for viewing!